Stevns Klint is a geological site which illustrates the impact of an asteroid that created global mass extinction of species some 65 million years ago. It is testimony to the Chixulub event, which in terms of meteorite impact is deemed as equally iconic as Vredefort Dome. These cliffs show high quality exposure of the Cretaceous-Tertiary (K/T) boundary section: the border is visible as a reddish layer in the strata. 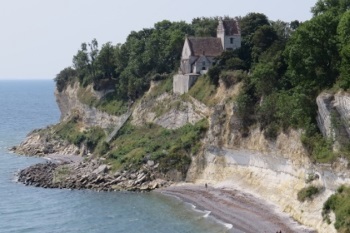 In 1980, a scientific team started to study the fish clay at Stevns Klint and found large traces of iridium, commonly found in cosmic material. This gave rise to a new theory that mass extinction wasn’t caused by extensive vulcanism in India, but was due to the impact of a giant asteroid. 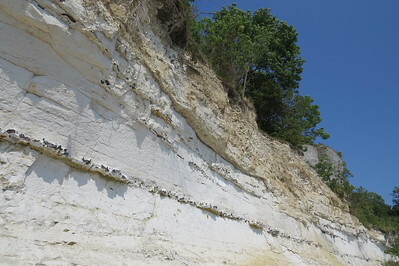 The cliffs of Stevns Klint are also rich in fossils. There is a significant fossil record before and after the K/T boundary layer. We already had these Pile Dwellings, where you have to stare intently into a lake to try and see some rotten wooden poles. And since this year we, WHS collectors, have to look at a 5 to 10 cm thick sediment layer in a cliff wall. Try explaining this to your colleagues at work. Despite all of this, Stevns Klint certainly isn't an obscure site. It is signposted from the motorway from afar. The road ends at a car park, and although the site has no entrance fee there's no escape paying for the parking. When I arrived at about 11 a.m. (having flown in from Amsterdam to Copenhagen earlier in the morning), there were already about 40 other cars present. I started with a visit to the 'museum', which seemed somewhat makeshift. The story of the site is told via information panels. In the corners of the exhibition hall some of the old exhibits (regional historic and folkloric stuff) still can be seen. As the visitor numbers have increased significantly since Stevns Klint became a WHS, they're planning to build a new visitor center. On the other side of the parking lot lies the infamous Old Church, which lost a part of its architecture in 1928 when the underlying cliff collapsed. The church was constructed of local limestone, and you can still see the marks on the cliffs where the stones for this and other buildings in the area have been carved out. 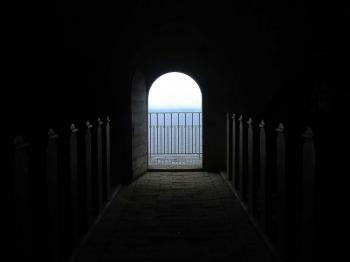 From the church, a long stairway leads down to the pebbled beach. Add some extra scrambling over rocks and you reach the white cliffs. The K/T boundary is high above your head and you have to know where to look not to miss it. There are numerous other layers visible, notably black ones containing flint. 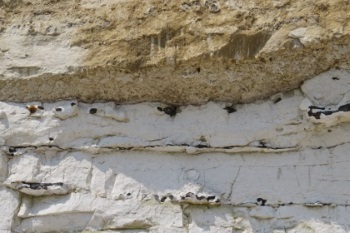 The grey or reddish K/T layer is just on the border between the white chalk and the yellow limestone rocks. I didn't see any fossils. Back on the cliff top again, I followed the trail along the coast for some time. It has good views on the cliffs and the precarious location of the Old Church. There were more tourists here then down below at the beach, which isn't that accessible for the elderly. Most visitors will come here for the panorama views and the small themed museums, a leisurely walk and an ice cream. Only the WHS diehard is satisfied when he or she has seen that narrow sediment layer. 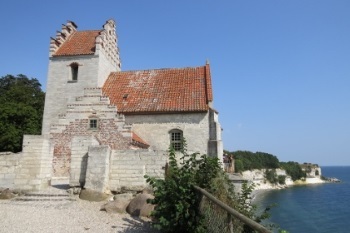 The day before I explored Stevns Klint I arrived in Hojerup after taking 4 trains and 5 buses from Schleswig TWHS in Germany, stopping in Christiansfeld WHS on the way, all connections of which were researched well in advance. But when I arrived at my B&B about 7 pm, exhausted, I was shocked to hear from the owner that there was absolutely no restaurant or even store in Hojerup that were open at that time. The nearest would be 4 km away. Having no car, I did not have the option to somehow try to get to the nearest town, as there were also no buses after 7 pm. So, I asked the owner if I could have a half of the breakfast for dinner and the other half for breakfast, which he duly complied. The inclusion of a whole loaf of bread in the breakfast helped. It was raining in the next morning when I explored Stevns Klint. My favorite little place within the core zone was the cliff-top church, as I thought it was very unusual that the altar area opened up to a balcony with a fantastic sea view. It reminded me of my favorite café in Laguna Beach, California. Most of the things about Stevns Klint have been said in the previous reviews. I would only add that this is the first WHS that made me think it should perhaps be called a Universal Heritage Site, as it involved a meteor, atmospheres, dinos, and whatnot. But that morning I was in fact thinking about one thing and one thing only: lunch. What appeared to be the only restaurant in town, Traktørstedet Højeruplund, was open for lunch, and I felt no shame in devouring over their Danish smorgasbord until I dropped. Visited Stevns Klint in September 2017. The place is very popular among locals, who seemingly spent the whole day there walking along the coastline and some attraction points like COld War Museum. 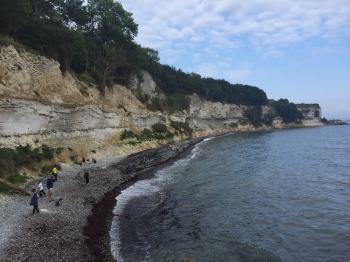 Also spent around 30 minutes trying to find any fossil on the beach below Stevns Klint but without success. Information leaflets provide indication of where very thin K/T layer is located. For ordinary person it's difficult to fully understand the scientific importance of this layer, but this is an integral part of WH sites, which cover so many different aspects of history, nature and culture, that they can't all be stunning lookers. You'd never know more details and information about extinction event and mysterious disappearance of the dinosaurs from the Earth. In overall, the place is quite a fun to explore and the sea views are good. As suggested by Clyde, next time will go to quarry Holtug Kridtbrud in order to find fossil. I visited this WHS in July 2016. I'd recommend downloading the huge informative Kalklandet app on your smart phone before visiting this site. It will help you locate the thin fish clay layer as well as identify any fossils you might find. The museum opens at 10am and apart from a few fossil examples and information boards, it is more of a local museum. The parking lot is automated so you'll still have to pay the day ticket to get out once your visit is ready. You can also pay by card so no cash or coins are needed. Knowing that bad weather was forecast in the afternoon, I decided to visit very early in the morning around 6:30-7am. This choice made all the difference as I had the whole site for myself for 3-4 hours. Firstly, I went down to the pebble beach by descending a relatively new but very steep steel staircase. Then you ascend a smaller but very old wooden staircase (which has seen better days!) and a very short trail through a patch of overgrowth full of peacock butterflies brought me to an apparent dead end and excellent lookout point (most of the pictures of previous reviews are from this viewpoint). I carefully climbed down to the beach over some loose rocks and limestone and was overjoyed to have the beach for myself. The morning sunlight is the best for photography and also very helpful to be able to spot the fish clay layer which is a very thin greyish brown sediment between the yellowish limestone, black flint with white exterior and white chalk. The fish clay layer holds traces of an asteroid that hit Earth 65.5 million years ago. When the asteroid hit our planet, this caused an enormous explosion and whirled huge amounts of dust into the atmosphere covering the Earth and blocking all the sunlight. It is believed that during this period more than half of all the species on Earth died out, including dinosaurs. American geologist Walter Alvarez was the first to find traces from the asteroid after analysing the fish clay in Stevns Klint. This is what gives this site its OUV as the full stretch of cliffs is full of fossils which help us learn more about our past. By looking upwards from the beach you can easily see the different exposed layers. I felt more comfortable to look as closest to the sea as possible as the cliffs are caving in and it is very easy to understand why the nearby chapel collapsed in the past! The top layer of Stevns Klint has traces from the last ice age, when large glaciers moved across the country like gigantic bulldozers. The hard limestone is made of bryozoan skeletons. These organisms lived in colonies which turned into the limestone bankswhich you see at Stevns Klint. It is relatively easy to find limestone fossils especially of ancient fungi or bivalves by cracking some rocks using the hard flint stone. Be very careful not to get carried away as I did as the flint is very sharp and I ended up with my first WHI (world heritage injury)! I was so excited to have found several fossils of shells, fish skeleton fragments, fungi and a very beautiful sea urchin fossil that I felt the minor injury was totally worth it even though it could have been avoided. The fish clay layer is quite high up and you'll need a decent zoom lens to get a closer look. The flint layers originate from the dissolved skeletons of silicious sponges (there is a big fossil of one in the museum), that inhabited the seafloor. When these organisms died out, their skeletons dissolved and over time in crustacean burrows in the seafloor, forming the flint layer we see now. The bottom soft chalk layer consists of billions of microscopic shells from algae which lived when Stevns Klint was covered by the sea. After a couple of hours I walked back to the staircases only to surprise a family of otters which were feeding on their early catch of fish! They soon vanished under the rocks and I went back up next to the church. I walked for about 4km to the opposite direction of the Stevns lighthouse to be able to see other lookout points over different stretches of the cliffs. The views are not particularly different from the church balcony view so don't bother if you're pressed for time. By the time I walked back the church has opened and there were the first couple of Danish tourists visiting. Most visit the museum for free and take in the view from the church so I wouldn't expect the beach to be overcrowded unless you're very unlucky. Just in front of the church there's a new UNESCO plaque. Next, I walked to the Stevns lighthouse and then after buying the hardback of the detailed nomination file from the museum, I drove to a quarry-like place called Holtug Kridtbrud further on from the lighthouse which is the best place to find fossils. All in all, I was very satisfied with my visit and I look forward to visiting the WHS in Devon, UK in the near future. It seems that statement didn’t fully convince my colleagues that my weekend trip to Denmark was a worthwhile undertaking. But I must admit, this turned out to be the most interesting site, from the underwhelming batch of recent additions the Danish have flung onto the world heritage list. On my drive to the site I listened to an episode of the BBC’s impressive (though unabashedly highbrow) In Our Time about the KT boundary. It did a great job of explaining the importance of the scientific discovery and also goes to show the sort of hedonistic experience you get on a holiday with me, ¡¡Cruising in a Dacia Sandero, pumping out the Melvyn Bragg, bring your neon vest and glow sticks!! Els has already described the visiting experience well, so no real need to expand on that. Just to say that in 2016 the museum still feels a little temporary, but explained everything I needed to know in a small manageable chunk, it also provided free wifi to enable me to download the very useful free app, that explained facts in further detail and pointed out features when I was at the cliff itself. The unseasonably heavy snow (it was late April) had abated by the time I descended down to the beach and the blue sky and crystal clear water gave an almost tropical feel, undermined only by the near zero temperatures. I spent a fair while just staring at the cliff, pretending I could identify the KT boundary, but inside dying a little as I had no idea where it was (I felt a little like this). I then went for a wander and discovered a herd of goats clambering along the cliff face grazing on tufts of grass in amongst the chalk. I also cracked open a few rocks and amazingly I found a fossil! It may not be the most exciting thing ever, but I was delighted to find a 65 million year old Tusk Shell mollusc. I went for a sit down on the beach, and researched my new find on the app, when I saw that there was a gadget that would show you were to look for the KT boundary on the cliff. So I opened it up and turned to face the cliff, and then, BOOM! I saw it instantly. I must admit it was actually a really stirring experience, much more exciting than you would expect seeing a line of sediment to be. Delighted to have “completed” my visit, I headed back up the steps, attempting to avoid the goat horns poking up through the gaps. Whilst it won’t top many ‘must see’ lists I rather enjoyed my visit to this site. I really did get a wow moment when I was able to identify the KT boundary and find a fossil, it made the importance of the site so much more tangible. Stevns Klint lies about 45 minutes drive from Copenhaguen. It is a 15 km long cliff along the coastline in which it is very easy to see different layers of strates. 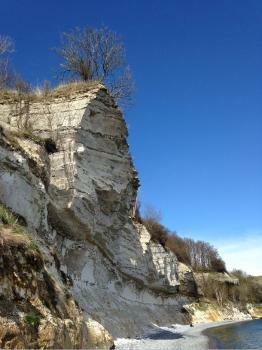 The upper strate is a Creataceous chalk (rich in fossiles) and the lower strate is a Tertiary Period limestone. The boundary between the Crataceous and Tertiary layer is a layer of fish clay, containing traces of great mass death (massive extinction of animals thought to be due to Earth being hit by a massive asteroïd). Visit to Stevn Klint is like reading in the Earth History Book. And those layer can be seen by inexpecienced persons. I drove to the village of Hojerup. The old church of that village is right on the cliff edge. Part of the churhc even collapsed into the sea in 1928. A strairway leads to the beach, where you can actually touch the different layers (and maybe find fossiles - even if I did not). Back up again, a pathway follows the cliff edge (you can actually hike along the 15 km of the cliffs). There is a small museum there. A few minutes north is the Setns Fyr (a lighthouse) from where you can see the Oresund bridge to the north and the Mon Island in the south. 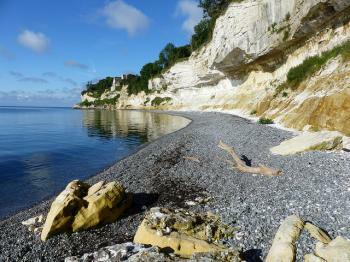 Altogether, the Stevns Klint is a nice half day trip from Copenhague, altough only with good weather confitions.